Market Inspirations — Wildflour Gluten-Free Baking Co.
Market fresh Rhubarb from the Redmond Saturday market! Rhubarb is one of those products you can only get for a short time each year. Those strikingly ruby stalks that our fellow market vendors have freshly cut from their gardens have been beckoning to me. Everyone seems to have a favorite Rhubarb recipe, but most of them aren't practical to travel to or serve at a Farmer's market. I've been brainstorming ways to incorporate Rhubarb into one of our baked goods, and a couple of weeks ago I finally had the answer! Strawberry Rhubarb Streusel bars! We make a Streusel bar of some kind throughout the year. Over the holidays it was Cranberry - Raspberry. Throughout most of early Spring it was Raspberry accented with a touch of lemon. Summer flavors will feature Blueberries, Apricots and Tart Cherries as those fruits reach peak season. These Streusel or Crumb bars are really the perfect dessert. Free of Gluten, Dairy, Soy & Eggs nearly everyone can enjoy them. A little Almond Flour in the crust and streusel topping adds protein, flavor & reduces the carbohydrate levels. They are not too sweet, with a sweet-tart filling sandwiched between a delicate pastry crust and a crunchy topping. 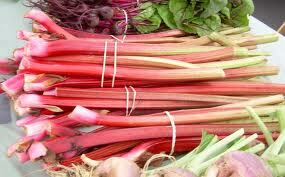 We hope to offer these throughout all of June, as long as we can get fresh Rhubarb!